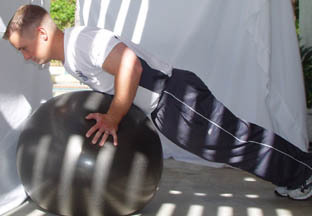 Start: Begin in a pushup position with your hands on the sides of the ball and fingers pointed toward the ground. 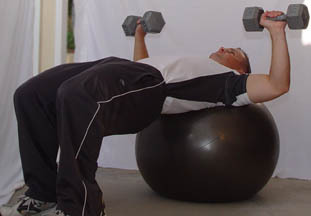 Keep your abs tight, glutes squeezed, and head straight. body tight without sagging in your stomach or chest. Start: Begin in a pushup position, with your stomach tightened, chest pushed out glutes squeezed, and head straight. Finish: Slowly lower your body by bending your arms. Continue to keep your body tight without sagging in your stomach or chest. 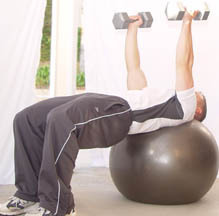 Notes: To make this exercise more difficult, move the ball more toward your feet, and less difficult, toward your knees. For advanced users flex your feet and place your toes on the ball (See Below). 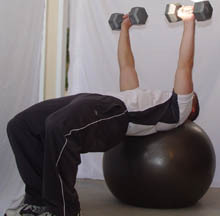 Start: Begin in a Bridge position with your head resting on the ball and the dumbbells in front of your body. shoulders. Do not let your elbows go lower than your shoulders. Keep your arms parallel to the ground. your glutes tightened and your feet close together. then slowly press the weight back to the starting position.